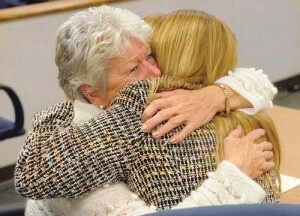 Brandon Swanson / The (Centralia) Chronicle Barbara Thompson, left, hugs friend Kim Edmonson on after a jury's unanimous decision in November that the Lewis County coroner was wrong to rule the 1998 death of Thompson's daughter, Ronda Reynolds, a suicide. A judge Friday morning said he will order the Lewis County Coroner to remove suicide as the official cause of death on Ronda Reynolds' death certificate. The ruling was a partial victory for the mother of the former Toledo state trooper, who died of a gunshot wound to the head at her home in 1998. Thurston County Superior Court Judge Richard Hicks said Reynolds' death certificate must be changed, but he did not tell Coroner Terry Wilson how it should be changed. Hicks declined to order that the cause of death be changed to homicide, which Reynolds' family had requested, saying he did not have authority to do so. Hicks said Wilson could call an inquest — a judicial inquiry into a cause of a death, usually before a jury — to make the determination. "In my view, he should either change the death certificate within 10 days of my order, or convene an inquest, which I cannot order him to do," Hicks said of Wilson. Wilson, a physician's assistant in Centralia and part-time elected coroner, said in a phone interview later Friday he will do whatever the judge orders him to do. Wilson said he has never called for a coroner's inquest during his nearly 30 years in the position. Whether he does so will await consultations with his lawyer, he said, though he sees only two choices. "You either change it to homicide or you change it to undetermined," Wilson said. "Those are the only options at this point." Hicks' Friday ruling follows an unprecedented civil trial over which he presided in November, in which a Lewis County jury that listened to testimony over two weeks found that Wilson's suicide determination was inaccurate. Reynolds' mother, Barbara Thompson of Spokane, has fought for 11 years to prove her daughter did not commit suicide, insisting that the Lewis County Sheriff's office badly botched the investigation. Reynolds, 33, was found dead by her husband in her Toledo home Dec. 16, 1998, a bullet through her head and a pillow over her face. She was covered by a turned-on electric blanket. Wilson originally listed the cause of death as undetermined, but he changed the ruling three times before settling on suicide. The only other people home at the time of the death were Reynolds' husband, Ron, and his two boys. At the time of her death, Reynolds was preparing to leave her marriage, which was less than a year old, and Barbara Thompson has tried to cast suspicion on Ron Reynolds, a Toledo school principal. The immediate impact of Friday's ruling was not immediately clear, but further legal maneuvering is likely. The Lewis County Sheriff's Office has declined to reopen the investigation. And Lewis County Prosecutor Michael Golden indicated following November's jury ruling that will not pursue any criminal prosecution unless the sheriff's office brings him evidence of a homicide. A coroner has five options when choosing the manner of death: homicide, suicide, accident, natural or undetermined. One of Barbara Thompson's supporters in court Friday, though, said an "undetermined" listing would be unsatisfactory. "Undetermined doesn't settle well in a mother's stomach," said Julie Colbert, a cousin of Ron Reynolds who sat with Thompson in court Friday. "Undetermined is not an answer." Wilson confirmed Friday he has decided not to seek an eighth term as coroner this fall, but not because of the Reynolds case. "I have no doubt if I decided to I could win if I ran again," he said. "But I've put in my time."